. : Optics & Photonics Focus :: Sailing through the Waves of Light :. Wave-like behavior: A rafting experience. A probe pulse (arrow on the top left) fills the cavity with photons. A control laser pulse (arrow on the left) takes the system from the ground state to its first excited state. The internal state of the atom changes to the tune of the light waves of the photons in the cavity, where it is in a strong coupling regime: it oscillates between the first and second excited states, while emitting and reabsorbing photons. These oscillations are called Rabi oscillations. The photons emitted (arrow on the top right) by the cavity behave like waves. Picture credit: Alessandro Ridolfo and Rocco Vilardi, Messina University. The interaction between light and matter is at the heart of today’s optical communications and it holds a lot of promise for powerful future quantum technologies. Our understanding of this interaction relies on the subtleties of quantum physics; however, in a simple picture, the internal state of an atom is a little like a sailor on a boat sailing through the waves of light: depending on the strength of his interaction with the waves, he can navigate almost without pitching or he can be drawn into a rocking motion. A team of scientists from the University of Messina in Italy now proposes a way of switching between these behaviors at the touch of an ultrafast laser pulse. This may soon become important for future quantum technologies. The interaction between light and matter occurs in discrete packages of electromagnetic energy, called photons. In a nutshell, an atom in its ground state needs to absorb a photon of a specific wavelength in order to be able to transition to its excited state; then, it decays back to its ground state by emitting the photon. An effective way to study this interaction is by placing the atom in an optical cavity, which serves as a storage box for photons of a specific wavelength. The simplest example of a cavity is a set of two parallel mirrors between which light can bounce back and forth for some time before escaping through one of them; the arrangement of the mirrors — their distance, in our example — determines the wavelengths of light that can be stored. Going back to our initial analogy, the atom is our boat sailing on the waves of the optical field created by the photons stored in the optical cavity. The strength of the interaction between the atom and the photons is also determined by how well the energy of the cavity photons matches the energy difference between the ground and excited state of the atom. We can distinguish between a strong coupling regime and a weak coupling regime. In the strong coupling regime, the internal state of the atom rocks to the tune of the light waves: it oscillates between two states, while emitting and reabsorbing photons — these oscillations are called Rabi oscillations. In the weak coupling regime, the atom is only weakly responsive to the photons trapped in the cavity. "A strong coupling regime is possible if the strength of the coupling overcomes the losses of the physical system," explains Rocco Vilardi from the Messina Group. Thus, our boat sails on the waves without nearly pitching. Particle-like behavior: A quiet crossing. An accurately timed sequence of two control laser pulses (arrow on the left) can take the system to the weak coupling regime. The internal state of the atom looks at the light waves passing by almost without pitching: the atom is weakly responsive to the photons trapped in the cavity; these photons, indeed, cannot excite it because they do not match the energy difference between the two excited states. The light emitted from the cavity (arrow on the top right) behaves like a flux of particles. Picture credit: Alessandro Ridolfo and Rocco Vilardi, Messina University. The Messina group studied a slightly more complex situation where both the strong and the weak coupling regimes are possible. 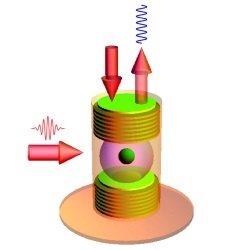 They studied an artificial atom described as a system with three energy levels: a ground state and two excited states. Since the energy difference between the first and the second excited state matches the energy of the photons of the cavity, radiative transitions between these two levels, with the associated emission and absorption of photons, is possible only if the system is promoted from the ground state to the first excited state through the ultrafast flash of light associated with a suitable control laser pulse. 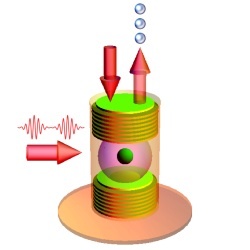 A second ultrafast control laser pulse with the right timing can successively switch off the strong coupling regime, taking the atom back to its ground state. "We have shown the specific conditions for complete control of the light-matter interaction," explains Salvatore Savasta, another member of the team from the University of Messina. "In particular, we have shown that timing is key. If the second control pulse is sent at a maximum of the Rabi oscillations, the system falls into its ground state by stimulated emission and the strong coupling is switched-off." Vilardi, Savasta and coworkers have actually gone a step further by showing that the oscillations can be restored using a third accurately timed ultrafast control laser pulse. If the control pulse is sent at a minimum, the switch-off of the strong light-matter coupling fails, but a new phenomenon occurs: the cavity photons, and also the matter excitations lose their wave-like properties. The latter can be restored using a fourth accurately timed ultrafast control laser pulse. "Such behavior," explains Vilardi, "is a direct consequence of the Bohr’s principle of complementarity, which refers to the ability of quantum-mechanical entities to behave like particles or waves under different experimental conditions." Where has the information about the oscillations been between the third and the fourth pulse? "The second control pulse can take the atom to its ground state, thus erasing the information associated with the vacuum Rabi oscillation," explains Vilardi, "but, we have discovered that, at the same time, it can create new oscillations in other degrees of freedom of the system, which keep the information in storage until the third control pulse arrives and restores it." Thus, intuitively speaking, the oscillation is not lost but has merely shifted to a different aspect of the system. "The possibility of ultrafast switching between regimes could be exploited for the realization of quantum logic gates," envisages Savasta. "The possibility to move the information about the quantum state of an atom could be exploited in hiding information in quantum cryptography, or it could provide an additional channel for storing and transmitting additional bits of information." Independently of the possible technological implications, Vilardi and Savasta conclude by pointing to the fundamental significance of their work. "We have shown that photons, but also matter excitations inside the cavity, can switch abruptly from a wave-like behavior to a particle-like behavior and then, if desired, back to a wave-like behavior, simply by sending suitable optical pulses." GV is Assistant Professor at Bilkent University in Ankara (Turkey); his research focuses on optics, statistical physics and soft matter. A. Ridolfo, R. Vilardi, O. Di Stefano, S. Portolan & S. Savasta, All Optical Switch of Vacuum Rabi Oscillations: The Ultrafast Quantum Eraser, Physical Review Letters (2011) 106, 013601 (link). R. Vilardi, A. Ridolfo, S. Portolan, S. Savasta & O. Di Stefano, Quantum complementarity of cavity photons coupled to a three-level system, Physical Review A (2011) 84, 063842 (link).